While not the most famous Hollywood in the United States. . . yet. 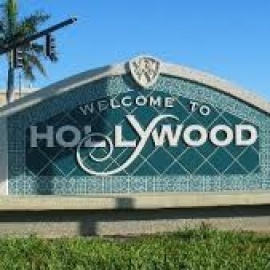 . . Hollywood, Florida is a magnificent place to both visit and live. No matter what your idea of fun and pleasure is, there is sure to be something to suit your tastes in the southern version of Hollywood. It is Florida, and there are beaches. Hot, gorgeous beaches with beautiful sugar colored sand are just waiting for you to toss out your beach towel. Bring your kids for a day of fun in the sun, or just bring a cooler of cool drinks, a good book, and a reclining beach chair. It is your day. There is a bustling nightlife here in our Hollywood. Plenty of restaurants abound with flavors that range from the exotic to homegrown. Dance clubs are here for the young (and young at heart), and theater for the culturally aware. Spend an evening with your loved one checking out the local art scene, or simply stroll down the boardwalk. In the daytime, Hollywood is beautiful even away from the beaches. While in the area, make sure you visit the beautifully preserved historic downtown district. A little something extra, Hollywood even has a trolley service. Move over San Francisco! Hollywood, Florida has it all. Bring your family, bring your honey, or just bring yourself! You will not regret the trip! South Florida's best Dancehall and Reggae event showcasing these jamaican artforms from all eras old and current. From Bob Marley to Vybz Kartel. Brett Druck is an American stand up comic best known for the viral success of his chivalry joke and as a cast member/guest host on Laughs TV Show seasons 2 & 3 on FOX and HULU .